For the first time perhaps since the fall of the Roman Empire, a group of centurions faces prosecution for mounting an assault on brother officers just a few paces from the Forum. 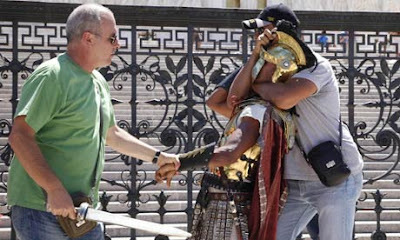 Unknown to the attackers, their fellow "centurions" were undercover police officers sent to investigate claims of racketeering and fraud in the shadow of the Colosseum. Dozens of modern-day Romans dressed as centurions or gladiators make a living by posing for photographs alongside tourists in return for tips and by enticing them onto tours in exchange for payments from the organizers. But the business has been plagued by complaints from holidaymakers of centurions resorting to threats, and allegations that it is a "closed shop" from which outsiders are rigorously, and sometimes brutally, excluded. The three men arrested on Wednesday have been accused of assault and risk additional charges of criminal conspiracy, according to the Corriere della Sera newspaper. They were among 30 people arrested as a result of the investigation. Others included tour guides and the owners of tour agencies. The officers posing as centurions were reportedly approached and threatened in the Piazza Venezia by the three men who were subsequently arrested. An argument broke out, and swords – albeit wooden ones – were soon cleaving the air. Unknown to the trio, a party of street cleaners at work nearby was also made up of undercover police officers. On seeing their colleagues attacked, they sprang into action and, watched by bemused tourists, clamped handcuffs on the aggressors. The police operation was launched after four complaints from tour agencies and two more from Italian tourists who said they had been tricked by a costumed tout into paying for a tour of the Vatican museums that never materialized and then threatened by him when they demanded their money back. 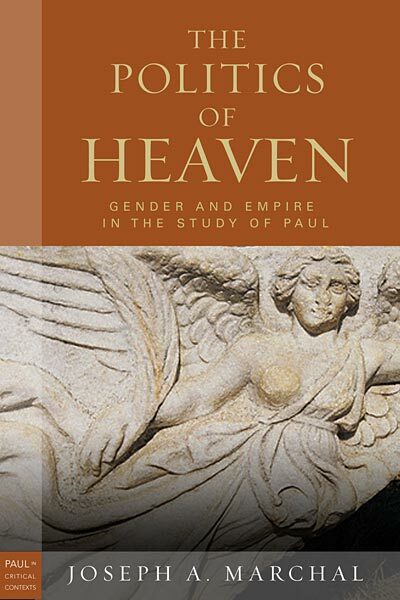 Was Paul an opponent of imperialism or a participant in the patriarchal social codes of his day? Joseph A. Marchal moves beyond this too-simple dichotomy to examine the language of power and obedience, ethnicity, and gender in Paul s letters, arguing that understanding the way rhetorics of power overlap and intersect requires a nuanced combination of feminist and post-colonial criticism and a "thick description" of colonized space. His analysis of gender and power dynamics in the Roman colony of Philippi is an exemplar of a new approach to reading Paul in his contexts, always attentive to the contexts of the contemporary interpreter as well. The Politics of Heaven offers new clarity and precision in the interpretation of the apostle and the social spaces in which he moved. Put your name below and I will choose a winner on Sunday. Winners have five days to claim the prize or it goes back on the shelf. This is an entertaining run through the Book of Acts with Stick People. I can't find one for the Gospel of Luke, but I am sure it would be just as fun. Questioning Adam and Eve: An Evangelical Galileo Moment? At the beginning of June I linked a post to a Christian Today article outlining how some Evangelicals are questioning whether Adam and Eve were real people of a mythical couple. Venema says there is no way we can be traced back to a single couple. He says with the mapping of the human genome, it's clear that modern humans emerged from other primates as a large population — long before the Genesis time frame of a few thousand years ago. And given the genetic variation of people today, he says scientists can't get that population size below 10,000 people at any time in our evolutionary history.To get down to just two ancestors, Venema says, "You would have to postulate that there's been this absolutely astronomical mutation rate that has produced all these new variants in an incredibly short period of time. Those types of mutation rates are just not possible. It would mutate us out of existence." Others argue, however, that rejecting a historical Adam and Eve means rejecting faith. One such person is Albert Mohler, President of the of the Southern Baptist Theological Seminary in Louisville. He believes that to not believe in an historical Adam is to undermine the major tenets of Christian faith. "When Adam sinned, he sinned for us," Mohler says. "And it's that very sinfulness that sets up our understanding of our need for a savior. 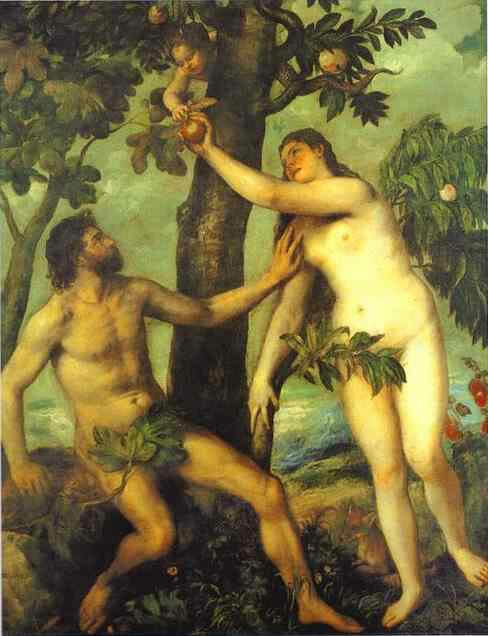 Mohler says the Adam and Eve story is not just about a fall from paradise: It goes to the heart of Christianity. He notes that the Apostle Paul (in Romans 5 and 1 Corinthians 15) argued that the whole point of Jesus' crucifixion and resurrection was to undo Adam's original sin. "Without Adam, the work of Christ makes no sense whatsoever in Paul's description of the Gospel, which is the classic description of the Gospel we have in the New Testament," Mohler says. "This stuff is unavoidable," says Dan Harlow at Calvin College. "Evangelicals have to either face up to it or they have to stick their head in the sand. And if they do that, they will lose whatever intellectual currency or respectability they have." The story is well done. You can either read it or listen to an mp3 version. Does it matter if Adam was a historical figure or not? Does it undermine the point and theology of the creation story if Adam and Eve are a religious myth? Update: over at Jesus Creed Scot McKnight is running a similar discussion this topic as well and has some good insights. 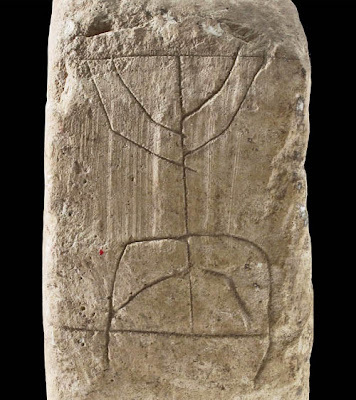 Earlier today I posted about the discovery of a Roman sword and a menorah scratched on a stone. Since then I have run across a 2 minute video clip showing the tunnels where the objects were found. The clip shows the tunnel and an interview with Eli Shukrun, one of the archaeologists overseeing the excavation. The video is in Hebrew with subtitles. You will also need to watch a short Israeli commercial before watching the clip. A few weeks ago I posted about how archaeologists were digging in the sewers of Herculaneum, a city destroyed by Mount Vesuvius when Pompeii was destroyed. Yesterday I posted on the Jewish holiday Tisha B'Av (the ninth of Av), which is the day on the Jewish calendar the traditionally marks the destruction of both Solomon’s and Herod’s temple. Today both of those topics come together. The Israeli Antiquities Authority (IAA) has announced the discovery of two rare artifacts, a Roman sword still in its scabbard and a stone upon which was engraved a menorah. These two finds represent an unusual combination of artifacts that bring us echoes of the Jewish revolt and the Roman destruction of Jerusalem and the temple (66-70 CE). The sewer where these artifacts were discovered runs from the pool of Siloam, which is also a relatively recent discovery. 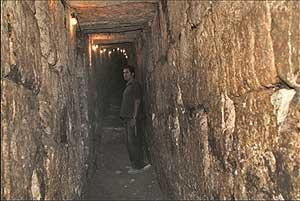 I walk with my team in that area just last month as we looked around the excavations in Jerusalem. Here are some highlights of what the IAA has to say about the discovery. On the eve of Tisha B’Av, artifacts were exposed that breathe new life into the story of the destruction of the Temple in Jerusalem. A sword in a scabbard that belonged to a Roman soldier and an engraving of the Temple’s menorah on a stone object were discovered during work the Israel Antiquities Authority conducted in the 2,000 year old drainage channel between the City of David and the Jerusalem Archaeological Garden. The channel served as a hiding refuge for the residents of Jerusalem from the Romans during the destruction of the Second Temple. You can read the rest of the article here as well as download some color photos. BTW, these are the same archaeologists who just last week announced the discovery of a golden bell from the same sewer. At first the media was reporting that it belonged to a high priest, but they seem to have backed away from that claim now. For a good overview of the history of the sewers and tunnels being excavated as well as the politics of the excavations, check out the Boston.com article In a Jerusalem Tunnel a glimpse of ancient war. 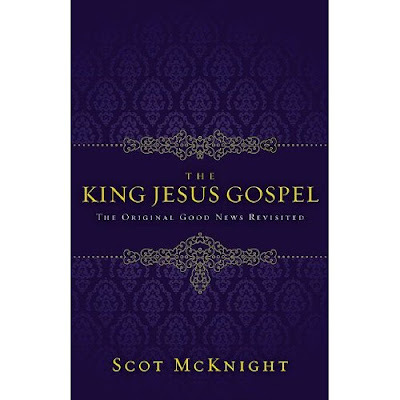 I got home from a week away at a conference in NY to find a readers edition of Scot McKnight's The King Jesus Gospel: The Original Good News Revisited. The book is being published by Zondervan and is slated to be released in September. Here is the description from Zondervan. The gospel is the declaration that Jesus is Messiah and Lord and that gospel declares that the Story of Jesus completes the Story of Israel in a way that saves. This gospel counters the shallow and superficial gospeling today that reduces the gospel to four simple points and eliminates the confession that Jesus is Messiah and Lord. Contemporary evangelicals have built a "salvation culture" but not a "gospel culture." Evangelicals have reduced the gospel to the message of personal salvation. 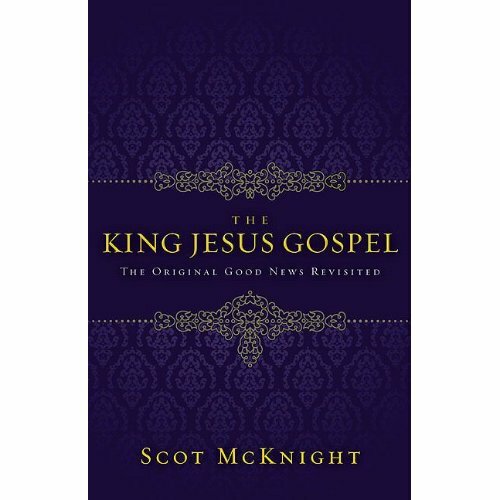 This book makes a plea for us to recover the old gospel as that which is still new and still fresh. The book stands on four arguments: that the gospel is defined by the apostles in 1 Corinthians 15 as the completion of the Story of Israel in the saving Story of Jesus; that the gospel is found in the Four Gospels; that the gospel was preached by Jesus; and that the sermons in the Book of Acts are the best example of gospeling in the New Testament. In the Beginning was the Gospel ends with practical suggestions about evangelism and about building a gospel culture. The editors are promising that this book will be somewhat controversial. From the description and what I have read so far, I think it will cause a stir. But I think it will be a good stir that will generate some much needed conversation on about the nature of the Gospel. In the front of the book Scot makes mention that Ashland Theological is among those to whom this book is dedicated. We invited Scot here in 2009 to be our fall lecture series speaker. Some of what is in this book was developed from those lectures. I look forward to reading and reviewing this book here in the coming weeks. Many thanks to Zondervan for sending me a copy in advance. Beginning at sunset last night, Jews around the world began to commemorate the destruction of the temple by the Romans in 70 CE. This holiday is known as Tisha B'Av (the ninth of Av), which is the day on the Jewish calendar the traditionally marks the destruction of both Solomon’s and Herod’s temple. Today’s picture is of rock tumble from the Roman destruction laying as it was found when archaeologists uncovered it in the 1960s and 70s. “Whoever did not see Herod’s Temple standing never saw a beautiful building his whole life” (Succah 51b). In the mid to late 60’s CE, Rome was struggling to put down a Jewish rebellion in Palestine. Titus, the future emperor of Rome, destroyed Jerusalem and the temple to discourage Jews from having nationalistic feelings connected to the city. 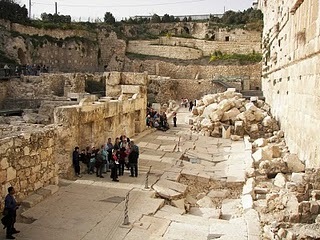 After the city’s destruction, Jews were generally prohibited to enter into the ruins. Once a year, however, they were allowed to enter in order to mourn the destruction of the temple. In 132 CE, the Emperor Hadrian was strengthening Roman power in Palestine. He also began to rebuild Jerusalem as a Roman city, which the Jews saw as a bad omen and a second Jewish revolt began which lasted until 135 CE. The spiritual leader of the revolt was Rabbi Akiva from Caesarea who was executed by the Romans. The military leader was a Jew named Simon who had Messianic qualities and aspirations. He received the name Bar Kokhba, “Son of the Stars.” It appears that for a while they had control of Jerusalem, but eventually lost. After the second revolt was defeated, Jerusalem was rebuilt by the Romans who changed its name in an attempt to erase the name from history. It was re-named Aelia Capitolina. Aelia was the family of Hadrian and Capitolina were the trinity of gods on the Roman hill and now declared to be part of the new city. The old city of Jerusalem today is based much on the pattern of the old Roman city, including the walls, the street lay out and the gates. In addition to commemorating the destruction of two temples, Jews will also remember the many calamites that have befallen them over their long history. It is solemn fast day and many will refrain from washing, working and even greeting one another. Coincidentally, archaeologists announced this week the discovery of a Roman soldier's sword and a stone etching of a menorah. Both were found in an sewer that was been the focus of recent excavations. The archaeologist, Ronny Reich, believes the sword may come from the time if the Jewish revolt. See pictures and read the article here. Is the 2011 NIV feminizing the Bible? The 2011 NIV was released late last year and like the TNIV it is not without its critics. The TNIV was panned by some who took issue with the gender inclusive language used by the translation team. The critics were so successful that the publisher could hardly give the Bible away. In response to the criticism, the translation team went back and reconsidered some of the work done on the TNIV including the gender inclusive language. But apparently not enough work, however, since the Southern Baptist Convention condemned the Bible in June. The translation is, for the most part, acceptable. The Greek word that has been translated as “my fellow Jews” is also translated as “my kinsmen” in the KJV and the NAS while the NRSV reads “my relatives.” The other translations are all possible and correct. The Greek term here can mean either relative, kindred or kinsman. But to extend it to suggest that these individuals Paul addresses here “Jews” is more interpretive than I would be comfortable with since we really know next to nothing about them. But where CBMW take issue is with the way the 2011 NIV makes these two people to be a man and a woman. Here is what the CBMW evaluation has to say about this. This verse changes "Junias" (a man's name) to "Junia" (a woman's name; the Greek spelling could refer to either a man or a woman), and now says that "Andronicus and Junia" are "outstanding among the apostles," thus making the woman "Junia" an apostle. This is a highly disputed verse, but the NIV now clearly gives more weight to the feminist argument that says there was at least one woman apostle, and if a woman could be an apostle (like Paul or Peter, presumably), surely women can be pastors and elders as well. Some other recent evangelical translations also translate this name as "Junia" (a woman), but at least three conservative translations do not then make Junia an apostle. Based on what we at CBMW think to be a better understanding of the Greek phrase episēmoi en tois apostolois, both the ESV and the NET Bible say that Andronicus and Junia are "well known to the apostles," and the Holman CSB says they are "noteworthy in the eyes of the apostles." Thus, the apostles recognized Andronicus and Junia, but they were not themselves apostles. (The new NIV also gives a similar reading to this as an alternative in a footnote.) We recognize that there are other explanations for this contested verse, but it still should be noted that, in contrast to three other recent evangelical translations, the new NIV adopts the translation strongly favored by feminists, apparently making Junia an apostle. Although the Greek term apostolos that is used here can sometimes have the weaker sense "messenger" (see John 13:16; Phil. 2:25), the new NIV does not give that as an alternative translation at Romans 16:7. Moreover, the English word "apostle" everywhere else in the new NIV refers to the absolutely authoritative messengers of Christ like Peter and Paul, and therefore readers of the new NIV will be led to conclude that women could be apostles of such stature - just like Junia. Now, if you read the above carefully you will note that they concede that the name could be either male or female. The problem, for the CBMW is that this verse suggests that women could be apostles in the early church. But let’s look at some other evidence. There are no accents in the early Greek text so it is not clear simply by looking at the original Greek whether or not this was a man (Junias) or a woman (Junia). An early copy of Romans from the late second century (200 CE) has the name “Julia” which is clearly a woman’s name. Consequently, early evidence suggests that this person was at least understood to be a woman in some manuscript traditions belonging to the early church. “Julia” also appears in some Latin, Coptic and Ethiopic manuscripts. Only one example of the name “Junias” for a man has ever been discovered outside of the New Testament. On the other hand, there are over 250 references to Junia as a woman. 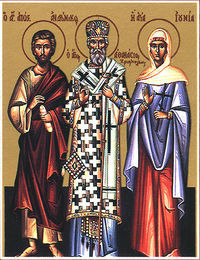 In church history, both Jerome and John Chrysostom understood “Junias” to be a woman. Jerome calls her “Julia” and Chrsyostom says “ O how great is the devotion of this woman that she should be counted worthy of the appellation of apostle!" (Click here to read the quote in context). It is only around the twelfth century that Junia was understood to be a man and not a woman. There is more that can be said, but this post is already getting a bit long. It is clear, however, that a decision on the translation/interpretation of this verse cannot be on the meaning of the Greek alone. The name here can be either male or female and thus we must depend on our information from outside of the Bible to make an informed decision. The weight of the evidence, however, is against the CBMW and in favor of the 2011 NIV. Junia was most likely known as an apostle and the 2011 NIV is not part of a feminist attempt to give biblical evidence for women pastors. The NIV is doing responsible transaltion work. If you are interested in this subject I can recommend a good book, which has helped to inform my own thinking on the topic: Eldon Epp Junia: The First woman Apostle (Fortress, 2005). He is the winner of this week's book giveaway. 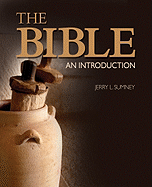 Kaleb has won Jerry L. Sumney's The Bible: An Introduction (Fortress, 2010). Kaleb, please send your details to me at jbyron@ashland.edu and I will send the book out this week. Remember, you have five days to claim the book or it goes back on the shelf. For those of you who did not win this week, check back again on Friday for another giveaway.